Holiday dress season is finally here! There will be parties and get-togethers all month long, which means there is not a better time for getting all fancied up to be merry and bright! 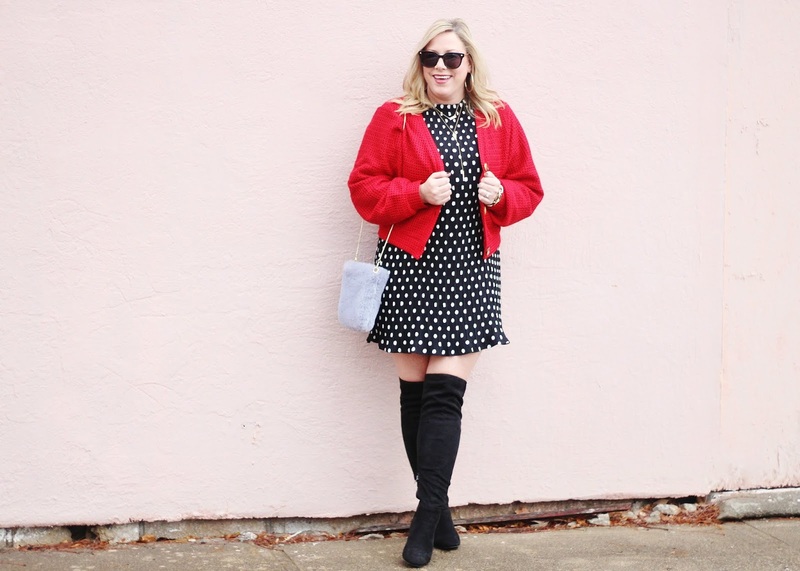 I stopped by @Jolly's, one of my favorite local boutiques this past week and picked up this fabulous polka-dot dress and cozy red cardigan combo! I'm absolutely in LOVE with this look for holiday time! I think this would be the perfect look for Christmas brunch with my girlfriends, a holiday happy hour, or a white elephant party with friends! 1.) Can I RE-STYLE the dress later for another occasion or another holiday event? 2.) Does it feel COMFORTABLE and does it have a forgiving FIT - for eating, drinking, and socializing? 3.) Does it have a FESTIVE print or color? 4.) Do I FEEL CONFIDENT when I wear it? If I can check off these few things on my list, I know I've found the right dress! 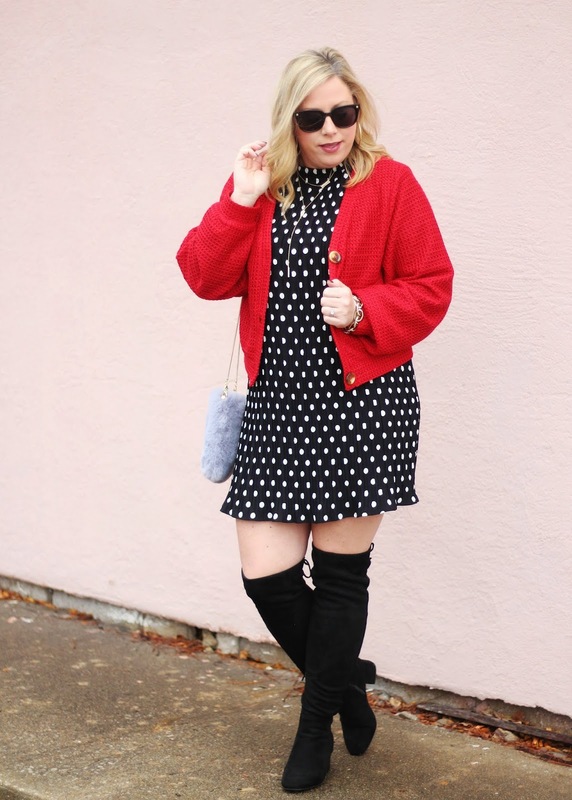 This sassy polka-dot dress definitely matched my criteria. It's flattering, fun, and loose fitting, which is so important when you want to relax and enjoy all the holiday goodies! Stop by @Jolly's and check out all their holiday dresses before they're gone! Connect With @Jolly's on Social Media! I always think that both red and polka dots are always so festive for Christmas season. Love this look with the fun OTK boots and fur bag. That cozy red cardigan is my favorite though. Happy December and Happy Holiday Season to you! <3 Ada. You made this dress perfect for the holidays with the red sweater. 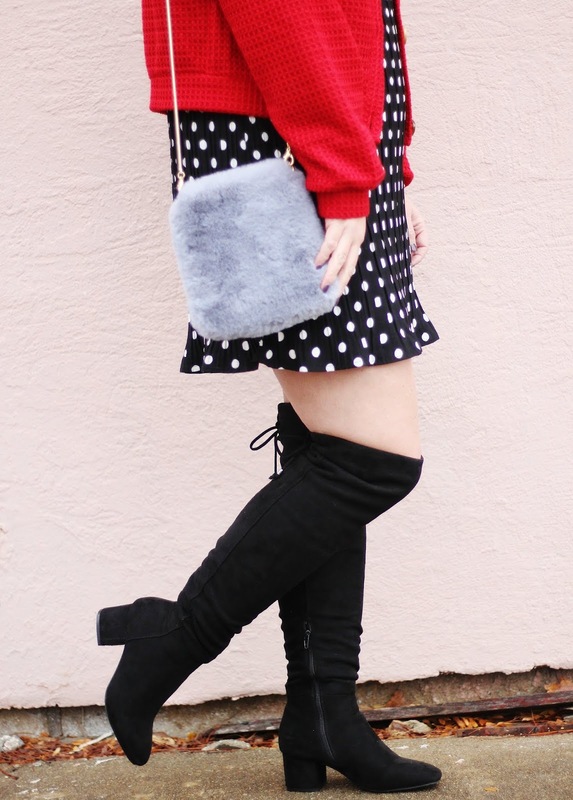 I love the polka dots because it's a great pattern that can really be worn so many ways!